Who should have helped the hurt man? Who did help the hurt man? Give me an example of some ways that you can be kind to people. Some stories talk about the Good Samaritan being a "foreign man". In this story a foreign man represents someone who is different than you. How can we be kind—even to people who are different than us? Name: Combine letter's in child's first name. - Smooth glue on the road of the Good Samaritan worksheet. Sprinkle with sand. Stick bandaids on the hurt man. 3. Punch two holes somewhere near the top of the zip-lock bag and have the child string a ribbon through the holes and knot it for a nice decoration. - Read Zuzu's Wishing Cake by Linda Michelin. This book gives examples of how your child can reach out to other children and show love to all children, especially those of a different nationality. Grab a container of train tracks or Duplo Legos to sort by length or size. - Introduce the letters Tt using the tactile letters and decorate the Letter Poster to add to the Letter of the Week book. - Play "Simon Says" and touch "t" body parts: toes, tongue, tummy, tushie, tailbone, stand on tiptoes. 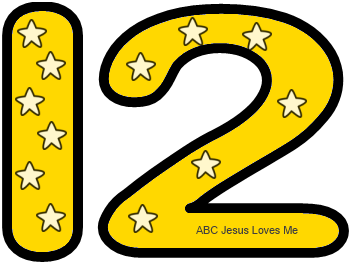 - This week paint using cotton swabs to decorate the Number 12 Poster. Add twelve stickers. - Read Miss Spider's Tea Party: The Counting Book to reinforce counting 1-12. Have your child read the counting words. If the child is ready, place all the 3" letters in the child's first name side-by-side in a dry erase pocket and assist the child in tracing each as you say the Letter Formation Chant. 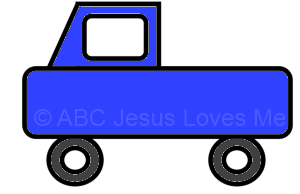 - Color the Little Blue Truck worksheet with colored pencils. Have your child cut around shapes that you have drawn on cardstock. Draw a circle, triangle, square and diamond using thick lines. Check out Teaching How to Use Scissors for ideas. Play basketball with rolled-up socks or a soft ball and a box or laundry basket.